At the bottom of the MadeToTag window, the user can access a drop-down list of options for locating and resolving problems. MadeToTag can locate problems which prevent straightforward creation of accessible PDF files. Select a function and click Execute to open the corresponding dialog. When this function is called, the MadeToTag Problem Locator window will open atLooking for hard returns. The window shows the Number of potential hard returns as well as the number of Fixed and Unfixed items. The interface at the bottom allows you to navigate, Fix items, Undo and Redo actions and close the window. When this function is called, the MadeToTag Problem Locator window will open at Find faux-hyphens. The window shows the Number of potential faux hyphens as well as the number of Fixed and Unfixed items. When this function is called, the MadeToTag Problem Locator window will open at Locate missing alternate text. The window shows the Number of objects without alternate text as well as the number of Fixed and Unfixed items. The text box lets you enter alternate text for selected images. When this function is called, the MadeToTag Problem Locator window will open at Find unassigned articles. The window shows the Number of unassigned articles as well as the number of Fixed and Unfixed items. When this function is called, the MadeToTag Problem Locator window will open at Find paragraph styles not mapped. The window shows the Number of paragraph styles not mapped as well as the number of Fixed and Unfixed items. When this function is called, the MadeToTag Problem Locator window will open at Find basic paragraph styles. The window shows the Number of basic paragraph styles as well as the number of Fixed and Unfixed items. When this function is called, the MadeToTag Problem Locator window will open at Find empty paragraphs. The window shows the Number of empty paragraphs as well as the number of Fixed and Unfixed items. When this function is called, the MadeToTag Problem Locator window will open at Find faux lists. The window shows the Number of faux lists as well as the number of Fixed and Unfixed items. For each item found, you can either create a new paragraph style or use a paragraph style from the list of styles already in use. When this function is called, the Find faux list window will open. The drop-down menu lets you choose whether to number items alphanumerically, with Arabic figures or with Roman figures. Click OK to open the Find faux numeric lists menu. When this function is called, the MadeToTag Problem Locator window will open at Find paragraphs with no stylesheet assigned. The window shows the Number of paragraphs with no stylesheet assigned as well as the number of Fixed and Unfixed items. Insufficient contrast makes it harder for readers with visual impairments to identify content. An example of insufficient visual contrast would be light gray text on a white background. When this function is called, the MadeToTag Problem Locator window will open at ContrastChecker. The window shows the Number of objects with insufficient visual contrast as well as the number of Fixed and Unfixed items. … to add export tags as a prefix which will be either assigned directly through the paragraph style or through MadeToTag. 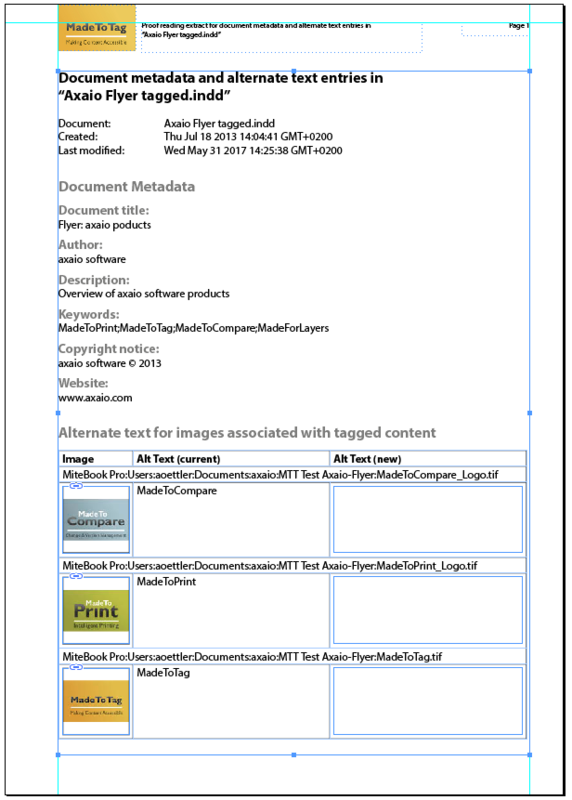 … to see an overview of the meta data in the document and alternate text for imagesin a new InDesign document.